On Tet holiday, Vietnamese people remain cultural tradition of decorating flowers, bonsai trees and colorful stickers in their houses. It is an indispensable part of New Year celebrations. Few days prior to Tet, markets with full of items are opened to serve huge demand of local people. 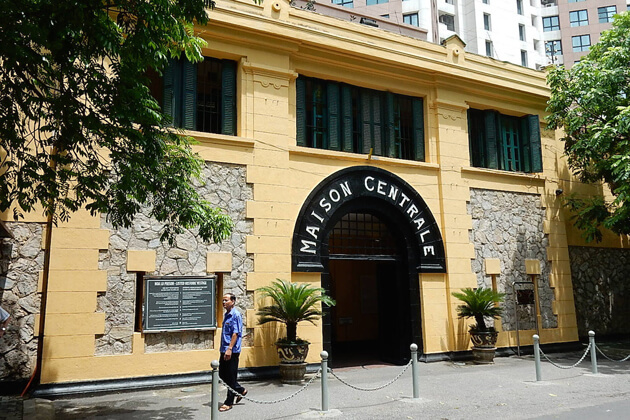 In Hanoi, Hang Luoc flower market with the age of hundred years, the delightful Hang Ma Street and the famous Quang Ba flower market are the typical places people should pay a visit at the pre-Tet time. 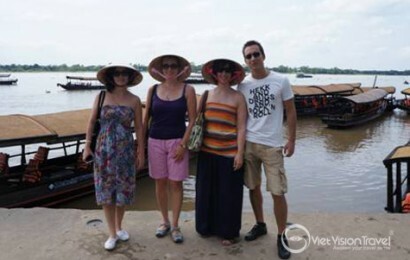 If your Vietnam vacation takes place during Tet holiday, you will experience vibrant atmosphere of people shopping for their traditional new year in those sites. Hang Luoc flower market located in Hang Luoc Street, in the very heart of Hanoi Old Quarter. 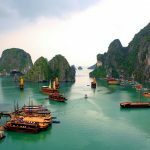 It is close to many famous destinations and easy for visitors to drop by. 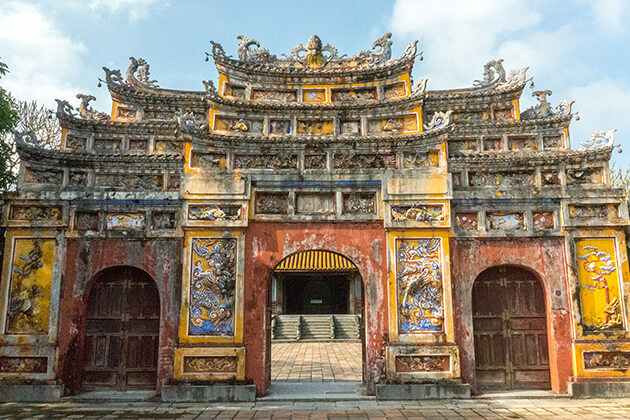 The market has already been opened for the Tet holiday in 2019. Established for more than a century, this well-known market runs once a year and lasts about two weeks before the holiday. 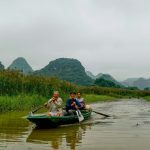 A wide range of plants associated with Tet holidays such as peach blossom, kumquat trees, ornamental plants and kinds of flowers are offered in large quantity. 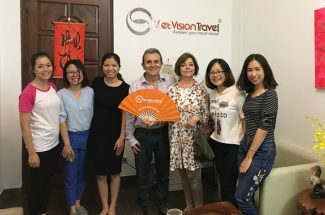 Peach blossom and kumquat trees in Northern Vietnam represent good luck and prosperity, while ochna blossom depicts affluence and honor among people in the Central and Southern regions. Other types of flowers are bought to add the charm to the houses. This custom shows people’s expectations for a new, fresh, colorful and beautiful year ahead. 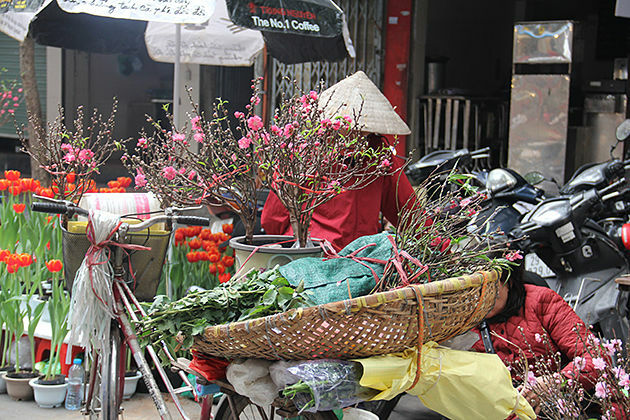 Thanks to the typical atmosphere, this flower market has become a major attraction during the time before the Tet holiday. Many people pay a visit to the site just to enjoy the bustling and special ambiance that evokes great memories in old days. On the street, you may encounter a lot of young ladies and girls who dress up well in the traditional dress – Ao dai and stand in front of cameras to take stunning photos in this remarkable period of time. To make the air more hectic, many artisans bring old items created skillfully from traditional craft villages and ornamental objects for the New Year. It is not just a trading point, but rather a place in which people meet others and exchange experiences. They perceive that exchanging ancient items plays an important role in the spiritual life and pays for luck for a fabulous New Year. 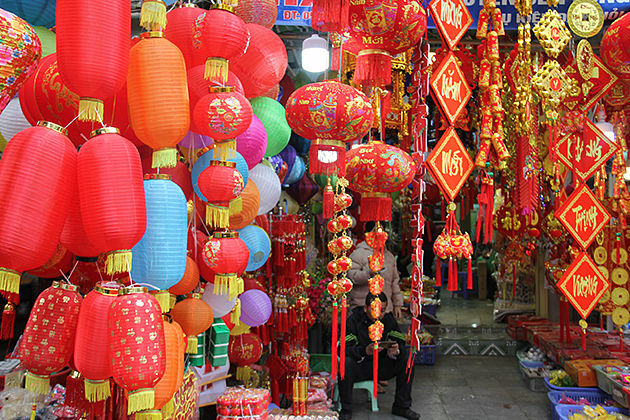 Next to the colorful Hang Luoc street, Hang Ma street impresses visitors by the richness of red – the prime color of all items decorated for Tet holiday and it presents wealth, happiness and luck for the new year. 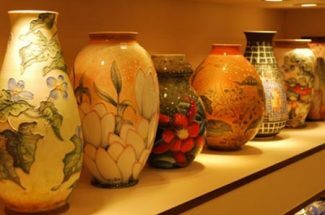 Not only at Tet, but Hang Ma is also full of florid items in other festivals in the year such as the Mid-autumn festival. Shop owners often start offering those lovely things for Tet decoration one month before the holiday. Shops remarked by delightful items stretch along the street which has seen a flurry of trading activities as the Lunar New Year is coming. Local people go to buy lovely things to decorate their houses or office. Many people visit the sparkling street to take photos or just to admire the festive atmosphere that takes place once a year. Further, retailers from neighboring areas also come there to by items in the large scale. The street packed with hurried people makes an in incredible scene. 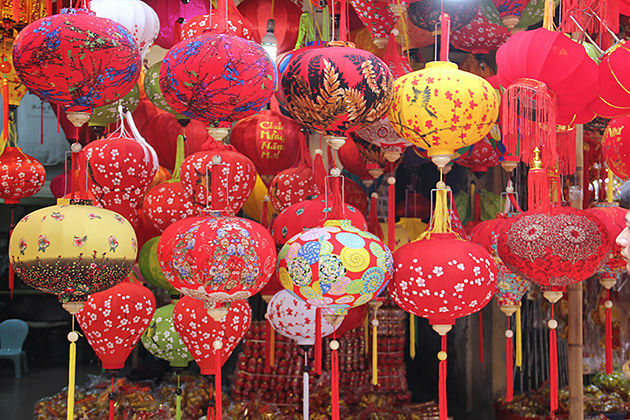 In front of the street, colorful traditional lanterns and decorated items are hanged neatly. Sparking lights, red envelops emblazoned with pig symbols for lucky money and red banner are brimmed at small stalls. Especially, according to Vietnam Zodiac, 2019 is the year of pigs. Hence, pig-printed stickers, stuffed pigs, pig-shaped balloons are so much common in the street. Quang Ba is the most famous flower market in Hanoi. It is getting more and more bustling as people are in hurry to prepare for Tet holiday. In usual days, the market just runs in the dawn, but at the pre-Tet time, you can stop by any time in a day to enjoy the exotic atmosphere of people shopping for the New Year. Peach blossom is the major flower offered in this period. People visit the market to see the atmosphere in the days before Tet and purchase flowers to take home. Some even have to wake up very early to pick up the freshest and most beautiful flowers brought from surrounding areas. Those markets are opened in small streets of the vibrant Hanoi Old Quarter, you are recommended to take a walk along the streets to avoid the congestion and freely enjoy pre-Tet hustle and bustle. Having trees, flowers and decorated items in the house during the New Year is a centuries-old culture of Vietnamese people. 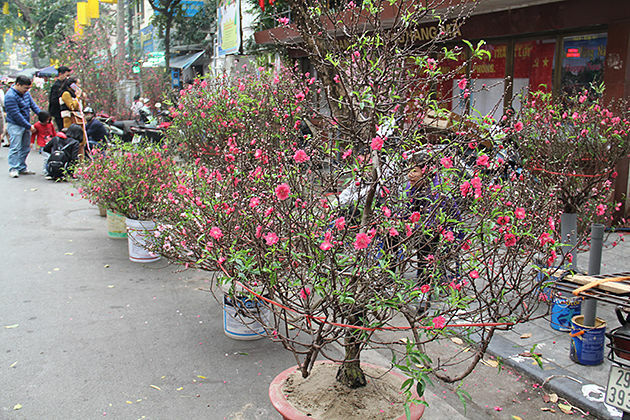 Traditional trees and flowers are irreplaceable practices in the preparation for Tet holiday. 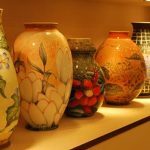 Those things not only make the houses more gracefully but also bring luck to the owners in the New Year.